Saying that one Professor Layton game is better than another is rather a lot like saying one delicious chocolate cake is better than another - whichever one you choose, you're going to get something really, really satisfying. As good as the other Laytons are, I still declare the latest installment, Professor Layton and the Unwound Future the clear champion due to its near-perfect delivery of clever puzzles, gorgeous visuals, and charm. Before you start arguing with me, let me reiterate: Both previous Layton games are guaranteed to deliver many hours of extremely enjoyable puzzle solving, and look great doing it. Unwound Future just does it all a little better. Take the story: Professor Layton's young apprentice, Luke, has received a letter that appears to come from ten years in the future. Odder still, Luke himself seems to be the person who sent it. No true gentlemen leaves a puzzle unsolved, so naturally the dapper Layton launches an investigation that (without revealing too many spoilers) involves time travel, missing scientists, a series of wet footprints, and an evil crime syndicate apparently run by the Professor himself. Previous Layton plots were just as wacky, but Unwound Future is just a touch more endearingly nutso, perhaps because Layton sticks to his home town of London instead of traveling to a far-off locale. 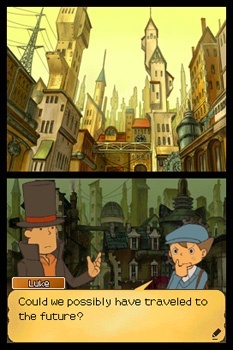 Charming as it is, the story of Unwound Future is really just an excuse for Professor Layton and his companions to wander around London, talking to people who almost always have a puzzle at the ready. The puzzles cover everything from matchstick conundrums to lateral thinking to jigsaws, but rely less on tried-and-true chestnuts than previous Layton games. Even puzzles that clearly draw inspiration from classic brain teasers are creatively updated or reinvented so that their time-honored origins are well hidden. The result is a grab bag of challenging head scratchers that never feel stale. Unwound Future's minigames receive a similar overhaul; collecting stickers to complete the stories in picture books is reminiscent of Professor Layton and the Diabolical Box's quest to track down tea ingredients, but doesn't evoke the same feeling of pointless busywork. Luke swaps out his overweight, obnoxious hamster (seriously, did anyone enjoy that creature?) for a zippy toy car, but still has to use directional tiles to guide it around an obstacle-filled track. Each group of minigames is just a series of variations around the same theme, which makes them a pleasant oasis away from the cerebral hubbub of the main game. If you're the kind of person who simply must solve each and every puzzle you encounter - as any true gentlemen or lady would, of course - you'll appreciate the respite the minigames provide. Even the best puzzlesmiths occasionally stumble when it comes to finding an answer, but Unwound Future does its best to give players plenty of resources to avoid becoming hoplessly stumped. The Memo function lets you use the stylus to make notes right on the puzzle itself in various colors of ink - a real help when trying to trace your way through a maze or do some quick calculations. Each location also contains a number of hidden Hint Coins that can be cashed in for nudges in the right direction. Complete enough of the parrot minigames, and he'll even point some of them out to you. Hints start out fairly vague, but spend enough money and the game will pretty much club you over the head with the solution. It's a wonderfully flexible system - the hints are there if you need them, but just difficult enough to access so that you can't accidentally spoil a solution for yourself. The real appeal of Unwound Future, and indeed all of the Professor Layton games, isn't the mental workout, but the games' overwhelming charm. The animated cutscenes are not only a visual treat, but an auditory one, too, boasting delightful voice acting throughout. More than that, though, is Unwound Future's whimsical earnestness. A game in which a talking bee doles out puzzles while a young British lad strives to emulate his top-hat wearing mentor could easily be cloyingly cute, but even the most jaded player will be enchanted by the experience. Bottom Line: Professor Layton and the Unwound Future is a brain-twisting delight. Show up for the clever puzzles, stick around for the gorgeous visuals and quirky minigames. Recommendation: My recommendation regarding whether or not you should pick up what I consider to be the best entry in a truly excellent series? That's a puzzle you should have no trouble solving. Susan Arendt is really, really bad at those sliding tile puzzles, but rocks the logic puzzles like a Vulcan.